Eastman Kodak, the 133-year-old iconic American company that invented the handheld camera, has filed for Chapter 11 bankruptcy protection. Kodak has struggled for years, losing huge profits on the now redundant film-based cameras and responding slowly to market changes. Despite this, the firm still makes considerable sums on inks and related supplies. The move follows a long-term restructuring plan by chairman and CEO Antonio Perez, who has steered the firm away from its traditional markets to printers. Since 2003, Kodak has closed 13 manufacturing plants, cutting its workforce from its 1980's peak of 145,000, to around 17,000. Its current value is around $150 million, a landslide from its $31bn valuation around 15 years ago. 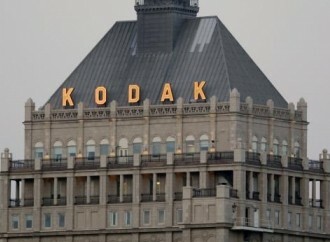 "The Board of Directors and the entire senior management team unanimously believe that this is a necessary step and the right thing to do for the future of Kodak," Perez said. "Our goal is to maximize value for stakeholders, including our employees, retirees, creditors, and pension trustees. We are also committed to working with our valued customers." He further added that employees would continue receiving wages and benefits and the firm would keep manufacturing, selling and supporting its products during the bankruptcy phase. This is largely due to the 18-month, $950 million funding it secured with Citigroup, enabling it to operate until it ends bankruptcy in 2013. "Chapter 11 gives us the best opportunities to maximize the value in two critical parts of our technology portfolio: our digital capture patents, which are essential for a wide range of mobile and other consumer electronic devices that capture digital images and have generated over $3 billion of licensing revenues since 2003; and our breakthrough printing and deposition technologies, which give Kodak a competitive advantage in our growing digital businesses," he further commented. As of filing, the company had around $5.1bn in assets and $6.75bn in debts at the end of September. The firm plans to sell "significant assets" during the bankruptcy according to court documents written by CFO Antoinette McCorvey. Non-U.S. assets, liabilities and production units weren't included in the filing and will continue functioning as normal.